Provide equal access to quality jobs, schools, and health services; affordable housing; safe parks and recreation facilities; public transportation; good schools; healthy and affordable food; and opportunities for physical activity. Listed below are a variety of social equity related projects completed by Kimberley Hodgson, as Cultivating Healthy Places’ owner and founder; as Senior Research Associate and Manager of the Planning and Community Health Research Center at the American Planning Association; as Research Assistant in the Department of Urban Affairs & Planning at Virginia Tech; or Field Faculty and Extension Specialist at Virginia Cooperative Extension. Growing Food Connections. The aim of the GFC project was to build the capacity of local governments and their partners to create, implement and sustain food system plans and policies that simultaneously promote access to healthy, affordable and culturally acceptable food and foster a viable agricultural sector in their communities. 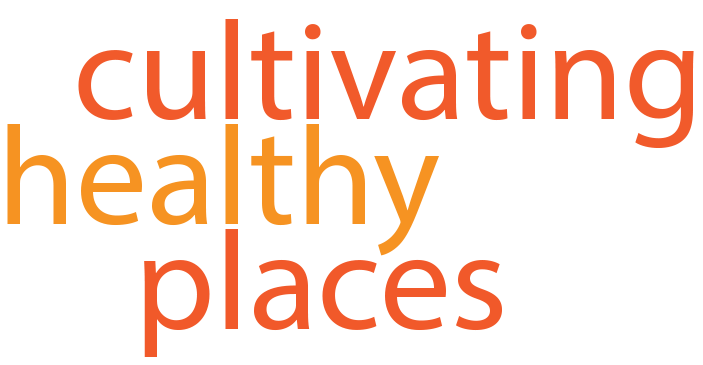 Cultivating Healthy Places was one of 4 organizations that led this 5-year, USDA funded project. Kimberley Hodgson served as co-investigator. Creating Community-Based Brownfield Redevelopment Strategies. Managed the development of Creating Community-Based Brownfield Redevelopment Strategies, a guide to redeveloping brownfield sites. This guide intends to empower residents to actively and effectively participate in brownfield site redevelopment and understand how different development strategies will benefit their communities. The Role of Arts & Culture in Planning Practice. As part of a collaborative project with the RMC Corporation and with funding from the Rockefeller Foundation, developed a series of briefing papers to illustrate how planners use arts and culture strategies to achieve economic, social, environmental, and community goals. Planning for Food Access Research Study. Awarded $100,000 from the Robert Wood Johnson Foundation’s Healthy Eating Research Program to identify and evaluate comprehensive and sustainability plans across the country that address food systems issues, specifically food access. Regulation of Food Access through Comprehensive Planning and Zoning. While a graduate student at Virginia Tech, authored a report on the role of comprehensive planning and zoning in regulation food access.